Post EDSA Democracy: Revolutionary President Cory Aquino arbitrarily abolished the 1973 Philippine Constitution, arrogated dictatorial powers to herself and dismantled the National Assembly, Supreme Court, local government units, civil and military services. She handpicked 48 Constitutional Commissioners to legitimized her democratic government. In 1987, the Filipino people ratified the 1987 Philippine Constitution and on the same year, national election was held. Local and barangay elections were held thereafter. The political left participated in the national election to test the waters in the so-called democratic space under Pres. Cory Aquino. 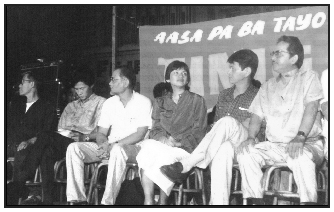 The honeymoon with the Left did not last long when the peace talks failed and thereby the Cory Aquino regime declared a total war against the communist-inspired New People's Army and the National Democratic Front. Disgruntled right-wing military staged a series of failed coup d'etat. The December 1989 military revolt almost toppled the Aquino government, but, foiled with the help of the U.S. Air Force F-4 fighters. In 1992, the Filipinos elected former General Fidel V. Ramos as the first elected president under the 1987 Philippine Constitution. The Ramos government laid plans for industrialization- Philippines 2000 in the next century. The former huge U.S. Naval Subic Base then converted into Economic Free Trade Zone and believe to be booming, however, overseas contract workers O.C.W. contributes billions of U.S.Dollars to the Philippine economy in form of remittances. Epifanio de los Santos Avenue a.k.a. EDSA, a Metro Manila broad boulevard wherein military RAM rebels(Enrile-Ramos) last stand against then President Ferdinand E. Marcos' superior forces in February 22-25 1986. The Army's Camp Aguinaldo and Constabulary's Camp Crame are located in EDSA, Quezon City. 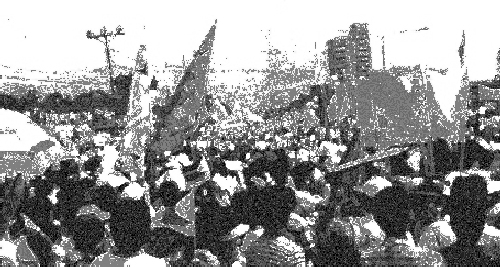 EDSA was the site of "People Power Revolution" that toppled Asian strongman Ferdinand E. Marcos.